It's the end of an era...my sandals that I have worn almost every day (weather permitting) since I went to Greece last year have died. I put them on after ballet class last week and while I was driving I felt something snap. When I got out of the car I looked down and saw nothing so I started walking and then sadly realized that they had broken. Well, they were only about $22 but they were the best sandals ever, they molded to my feet (as you can see in the photo). So comfortable, I almost cried. Well, if I had to guess at what this means, I can clearly say, must be time to go to Greece again! PS - they are still sitting by the back door today, like I could slide them right on and walk out and go on with my day, but I can't. I also can't take them to the garbage can. Sniff. I literally gasped when I saw this dress - so Tribal yet modern and orange! Hello, are those feathers at the bottom? I think I may be able to conquer the world in this dress! Gucci Ready to Wear Spring 2011. The color alone makes my heart rate speed up a bit. How I long for the Emerald City! Maybe the Wizard can help me get this dress! Gucci Ready to Wear Spring 2011. I bet if I wore this to my next job review, I would get a raise in a snap due to its ability to hypnotize anyone in its presence. Prada Ready to Wear Spring 2011. Tell the Skipper to bring the yacht around to the other side of the dock so as many people can see me as possible as I embark on my journey around the Mediterranean. Seriously, this dress and a GIANT sunhat and huge white sunglasses....I may even risk a lower SPF. 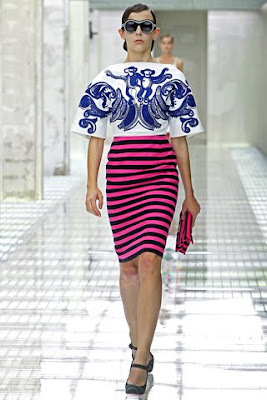 Prada Ready to Wear Spring 2011. As a reward for living a year on nothing but water and French Leek Soup I might have to buy this one. Seriously, the striped skirt and the monkeys on the top. So many wrongs make it so right. Nobody talk to me until I have this outfit. Prada Ready to Wear Spring 2011. Warning...don't go there, you will spend hours watching runway shows (or maybe that's just me, but I don't believe this was an isolated incident). For once, I actually have some of the stuff in this post, the shoes (both pair) and the leotard! Tim's Grandma passed away, very sad. Tim has been sick, but is on the mend now. Working on a HUGE project at work (what else is new, but really this is BIG, cannot disclose until it is done). Taking a ballet workshop that lasts a year! Two weeks in and I LOVE it. I super love muscle memory. In addition to aforementioned once a week ballet class, I added a midweek class that is a little more intense which I super love! Still hate sewing elastics on my ballet shoes - seriously thought about FedExing them to my Mom. Have spent some good, productive time at The Bird's Nest making books. That's about it - if this counts for anything, I started this post on Friday and am just finishing it now (Sunday). Ech! 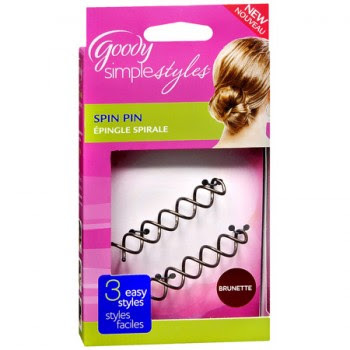 Finally, after months of searching, I found the Goody Spin Pin the other night and I super love it. I almost always wear my hair in a bun of some sort and Goody claims this is how the "undone bun is done" and I think they are right. They also say it does the job of 20 bobby pins, I think they are right on that claim as well. I am so bad at styling my hair, I generally air dry and let it hang or pull it back, that is it (unless my sister is around the braid it) so this tool is great for someone like me. These little spin pins can do no wrong in my book! One of them held my bun all day yesterday without loosening its grip! Where were these when I was taking ballet as a teen? Here is the commercial that sucked me in! I didn't get all the other stuff as each item is sold separately at your local drug store, but check it out! 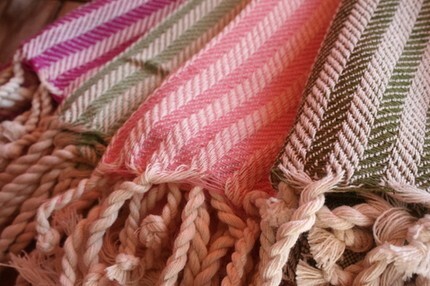 I recently got a pair of Turkish Hamam Towels (peshtemal), I have always thought they were so beautiful but it seems like a lot of places that sell them advertise them for beach towels, waist cloths, table clothes and anything but a towel in your bathroom. They also mention the fact that they are highly absorbent, fast drying and take up little space (that is what sold me). I thought I would give it a try and see how I liked it as a towel after my shower or bath. After some research, I learned that you should wash the towel twice before using it, the more you wash it, the more absorbent it becomes. Today was the day...it was there hanging on the hook in my bathroom pink with white stripes and the size of a bath sheet all ready to dry me off after emerging from the shower. I was a little skeptical as it felt more like a dish towel than what I am used to i.e. ; thick, terrycloth and thirsty. Once I got out of the "think tank" (shower) I grabbed it, wiped my face off and dried myself off. Wow, it was super absorbent and didn't feel heavy and wet like a normal bath towel. I wrapped myself in it and combed out my hair and you know what, I really liked it! My skin didn't feel damp underneath like with a regular towel; regular towels just seem to lap up the moisture and hold on to it for dear life and sometimes it takes an entire day to dry! Let's face it folks, I live in a pretty damp area so I may be on to something with this. 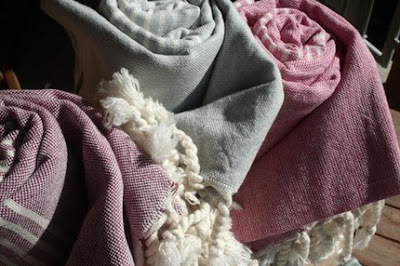 I will use it for a week and see if the results remain the same, but so far so good and these towels are so pretty, why not add at least one to your bathroom? Here are some good sources at reasonable prices ($25 and under), I have found some places sell them for upwards of $50 a piece, which I think is ridiculous! Peshte (Etsy) - click here. TurkishBath (Etsy) - click here. Berber Trading - click here. 1001 Days (Etsy) - click here.